When my daughter asked me to whip up a few midweek cocktail bites for a group of her friends, I looked in the cupboard. There was the old faithful can of wild Alaskan salmon; so, what about fish cakes? I’ve been making fish cakes for my grandchildren for years, and their parents are always ready to eat any leftovers. I thought why not jazz up the basic fish cake with some herbs and zip them up with some hot sauce, make them small and serve them with a dipping sauce for finger food. Catherine’s friends dove into the fish cakes like they were something new. Everyone wanted the recipe, and they didn’t know it’s simple enough for 7-year-olds to prepare. Tonight on NPR I heard a reporter make the statement, “In order to deal with the future, we may just have to go back in time.” Once, not all that long age, fresh salmon wasn’t stocked in every supermarket and salmon usually meant canned fish. Vintage cookbooks from the 1950s all have lists of salmon loaves, patties or salads made from canned salmon. Farmed Atlantic salmon now overshadows this forgotten treasure on the grocery shelf, but when you’re looking for a more sustainable fish, a less expensive fish, and a great nutritional bargain, consider adding a can or two of wild Alaskan salmon to your pantry shelf. 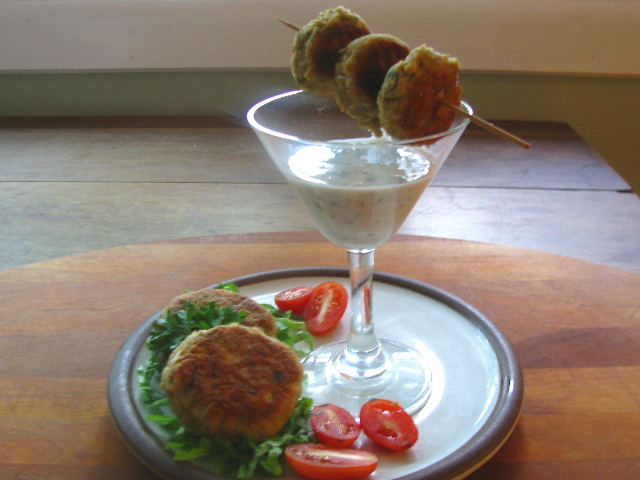 Fish cakes make a quick-mix meal and comfort food for all ages. * To make soft breadcrumbs, tear or cut approximately 3 slices of bread into chunks. Drop the bread pieces into a whizzing blender or food processor until they become coarse crumbs. For a gluten-free option use 1 cup mashed potato. Note: this recipe may be halved using a 7 oz. can of salmon. Drain and reserve broth from the canned salmon. Pull off the skin and remove bones (bones may be crushed and added to the salmon for extra calcium) and crumble the salmon into a bowl. Drizzle ¼ cup or more of the salmon broth over the breadcrumbs and allow to soften. Mix with your fingers until the bread feels like cooked potato. Combine the softened bread, crumbled salmon, grated or chopped onion, eggs and optional seasonings. If possible allow the mixture to rest for 10–15 minutes to allow the bread to absorb more moisture. Scoop the salmon mixture into 2 oz. balls using an ice cream scoop (makes 12), and break the balls in half for bite-size cakes. Flatten the balls slightly, dust each side with flour or cornmeal and brown in a hot no-stick skillet lightly filmed with olive oil. Cook the cakes about 3 minutes on each side or until golden. Makes 12 2 oz. cakes or 24 1 oz minis. To prepare a yogurt dipping sauce: crush a clove of garlic and 3 slices Serrano chili, including seeds, with a pinch of coarse salt in a mortar or using the tip of a chopping knife on a wooden board. Mix the chili/garlic paste with 1 cup plain whole milk yogurt. Add a tablespoon finely chopped fresh mint or parsley, a dash of ground cumin and freshly ground pepper. Makes 1 cup. Before I was old enough to know about calories and waistlines, I dreamed of coming home from school to find an iced chocolate cake waiting under a glass dome. More likely I would scratch up some graham crackers, a glass of milk and a couple peaches. I was blessed with abundant homegrown produce, but like any kid I wished for the bakery. Now we’ve learned too much: we shouldn’t be having the sugars and white stuff. We think every snack should be healthy, yet we’re still looking for ways to make nutritious tidbits tempt our children as much as chocolate chip cookies. 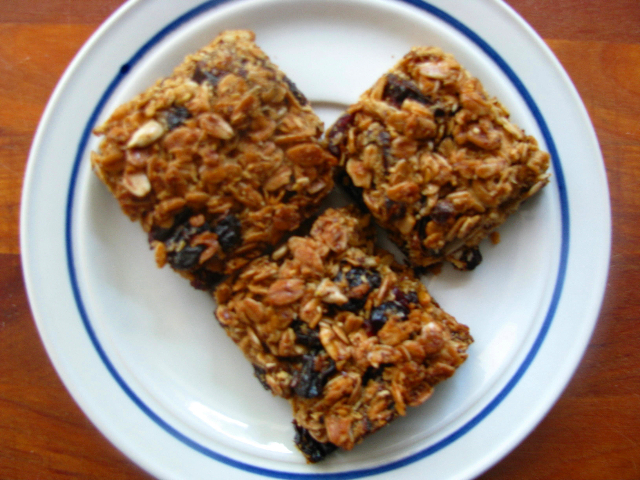 When I thought about my grandchildren munching our homemade granola, I began to work the formula into a bar cookie that could go into a school lunchbox. Yes, there’s some sugar, and I found the best flavor from cones of unrefined, caramely Mexican raw sugar (piloncillo) now available along with packaged dry chilis in supermarkets. A little honey will add to the crunch while minimal butter and olive oil will give the bar rich flavor. Whole grain oatmeal and flax along with some dried fruit and optional nuts or seeds round out this cookie that’s far more nourishing than a bowl of Cheerios. If using piloncillo, place cones in saucepan with water, cover and simmer until sugar has dissolved and formed a thin syrup. If using brown sugar, boil the sugar and water to form a syrup. To the hot syrup add honey, cinnamon, salt, vanilla, butter and oil. Stir in the oatmeal mixture, coconut and dry fruit. Spread evenly into a buttered 8-inch square tin. Cut through the mixture with a bench scraper or small sharp knife to form 16 squares. Bake the bars in a 325 oven for 30–40 minutes or until deeply golden. Cut through the score marks again before the bars cool. If bars do not seem crisp enough, return to the turned-off oven and allow them to dry and crisp further as the oven cools. Makes 16 bars and extra crumbs to sprinkle on breakfast cereal. You are currently browsing the Mary Jo's Kitchen blog archives for September, 2011.